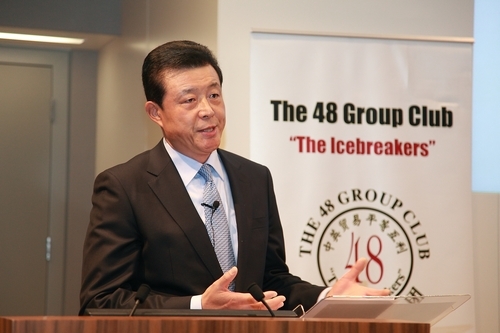 It gives me great delight to accept this invitation from the 48 Group Club. 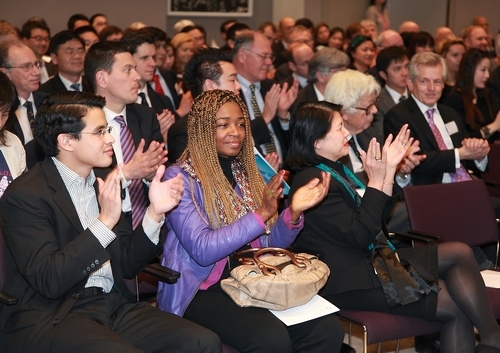 Your members embody a spirit of friendship and business exchange with China that reaches back almost 60 years. You should be proud that your Club is famous amongst Chinese people. 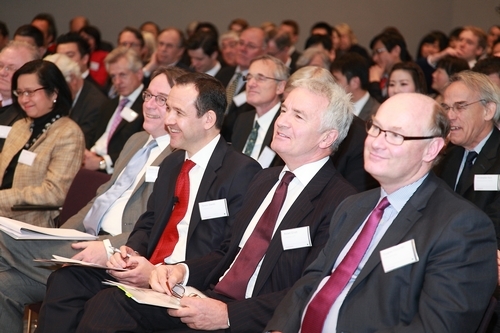 It is greatly respected as the oldest foreign business association of any in the world with New China. 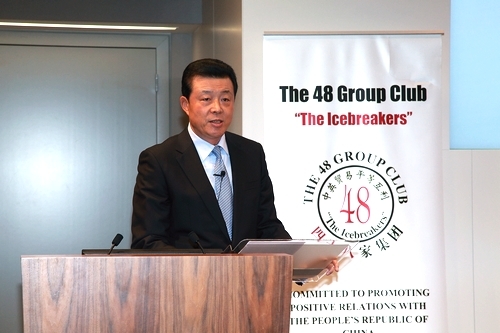 Throughout this long relationship the 48 Group Club have been close observers of the major milestones of the evolution of the People’s Republic of China. So you, above all, will appreciate the great significance of the recent meeting of the 18th CPC Congress in Beijing. In past decades the British media paid very little attention to the Congressional meetings of the Communist Party of China. But, for the 18th Congress the British media have closely followed this meeting. This reflects the growing understanding that China has a crucial role in the future of the whole world. So it was not surprising that some observers say it was the world’s most important political conference this year. I had the honour of attending this meeting. So it is my pleasure to share my observations with such distinguished and long friends of China. In my view, the 18th CPC National Congress answered four questions. The first question is how the CPC has maintained its vigor and vitality – even though it is now 91 years old. Democracy within the party is the fountainhead of the CPC’s dynamism. Some British media compared the 18th CPC National Congress to the presidential election in the USA, suggesting these are the two most important elections this year. In their reporting and comment the UK media showed intense curiosity about how CPC leaders are elected. The reason was that for UK media they believe that the CPC is opaque and mysterious. In fact the elections at the 18th CPC National Congress were solemn but not at all mysterious. The election took place in strict accordance with the institution and procedure stipulated in the CPC Constitution and other related rules. The whole process was clear and predictable. It fully reflected the progress of democracy in CPC. In turn the new Political Bureau and its Standing Committee were elected at the first plenary session of the new Central Committee. Another vital aspect of the 18th National Congress is the Report that is delivered by General Secretary Hu Jintao. The Report matters as it is the political manifesto and action guideline of the CPC. The drafting process to create this 18th Congress Report embraced full democracy. It extensively solicited opinions from various sectors and crystallised the wisdom of people inside and outside the party. During the one year from the setting up of the drafting team to the opening of the congress, the CPC Central Committee tasked dozens of institutions to carry out surveys and research on over ten major subjects. This included listening to the views of non-CPC members. The draft 18th Congress Report then went through several rounds of thorough discussions in the entire CPC. During the 18th Congress, the draft was further revised upon the suggestions and comments of the delegates. So we may well say that the Report is the work of full democracy and the brainchild of both CPC and non-CPC members. These efforts have greatly advanced the democracy within the CPC. The 18th Congress established a system that gives Party Congress delegates the mandate to make written proposals. This is a significant decision on promoting democracy within the Party. It offers an institutional guarantee for every Party Congress delegate to make comments and proposals on CPC’s policies. The report also stressed the need to raise the ratio of ordinary workers and farmers in the Party Congress delegates. This means voices form grassroots level will be better heard. The CPC has all along insisted on using its democracy to catalyse democracy across China. So the progress of CPC’s democracy will have a rippling effect. In the past 10 years democracy in election, consultation and at community level has steadily advanced. Selection of party officials has became more transparent. The ratio of people’s congress deputies to local population in rural areas was increased to the same as in cities. The selection system was further improved. Information disclosure of governments at all levels was gradually advanced. Now the general public may exercise their right to information, participation and supervision through the internet and ‘weibo’. Many of you will know this as the Chinese version of ‘twitter’. Government agencies also make public their budget and expenditure and respond to public concerns through the internet. Such progress is increasingly widespread across China. The 18th CPC National Congress made it clear that China would continue to move forward political reform actively and properly. There is a commitment to broaden and promote people’s democracy to its full. In the future Chinese style democracy will better adapt to realities in China and make true the Chinese nation’s dream for democracy. The second question is why the CPC has enjoyed the continuous support of the Chinese people. The motto of the CPC is repeated in many signs and posters across China. This is: To serve the people heart and soul. Serving the people is a prominent feature of the report delivered at the 18th Congress. General Secretary Hu Jintao stressed in the Report that the CPC can only prosper by staying in close contact with the people and serving the people. When the members of the new Standing Committee of the Political Bureau met the press, General Secretary Xi Jinping spoke for only a short time. But in his brief talk, the word people was mentioned 19 times. People’s aspiration for a beautiful life is the goal of our endeavor. These were plain words, but they showed that the CPC, as the ruling party, put the people’s interests above anything else. They are a powerful example of CPC’s clear understanding of its own purpose and mission. China is now the second largest economy in the world. High on the CPC’s agenda is not only continued economic growth, but also achieving a development of the people, for the people and by the people. Going along with the people’s expectation for a better life, the Report at the 18th congress set out comprehensive plans for ensuring and improving people’s life. In particular, the Report set the target of doubling, not only GDP, but also incomes by 2020 on the basis of the 2010 level. This is the first time that the CPC has set clear target for the growth of people’s income. The Report at the 18th congress also talked about building China into a fair society, a society guaranteed by fair rights, opportunities and rules. People will have equal right to participation and development. It must be noted that the goals of improving people’s life set out in the Report are not a mirage, nor simply paying lip-service. All of the goals are tangible and attainable. All of these aims are reachable in the near future. Naturally such a Party that puts people first and is committed to serving the people has won the trust and support of the people. In turn the people will continue to give it the power to govern and the power to lead. The third question is why the CPC has been able to keep abreast with the time. Whether a political party is advanced or backward is determined by its guiding thought. The CPC’s guiding thought has been constantly updated. The recent 18th Congress established the ‘scientific outlook on development’ as its new guiding thought. This is an innovation in theory. It is based on the CPC’s many explorations in the past decade. This latest theory is Marxism adapted to Chinese realities and matching overriding global trends. This guiding thought sheds new light on some major questions. Such as what kind of development China wants and how China can achieve such development. · and great progress in building a resource-conserving and environment-friendly society. Among these five aspects, preserving the environment is newly added at the 18th Congress. It shows that environmental protection and sustainable development assumes greater prominence in China’s development. We not only want a rich, strong and democratic China. We also want a beautiful and environmentally sustainable China. The concept of ‘Beautiful China’ has strong links with Britain. Several years ago the BBC and China’s Central Television jointly made a documentary about China. Its English name is ‘Wild China’. But its Chinese name is Mei Li Zhong Guo which translates as ‘Beautiful China’. This highly popular documentary recorded China’s spectacular natural landscape animals and exceptional biodiversity in flowering and fruiting plants. When we say we aim at a ‘Beautiful China’, we want those rivers and mountains to be seen by future generations. Moreover we want to ensure a balance between a clean and pleasant environment and increasing fertile land for farming. We want future generations to enjoy blue sky, green landscapes and pure water. This is precious legacy which future generations are entitled to. All in all, the CPC is a party with a free and open mind. It is down to earth. It seeks truth from facts and keeps up with the times. It always looks to something new and fresh in ideals, in theory and in practice. It always echoes the call of the times and follows the wish of the people. A political party with these qualities must be an advanced party. The fourth question: where does the CPC’s confidence come from in its chosen socialist path with Chinese characteristics? Different countries have different histories, cultures and national conditions. Each country’s development path is the choice of its own people after long explorations. So it is essential that we should respect the choice of different nations and respect the richness brought by diversity. The alternative is an unacceptable path that is myopic and seeks to impose fixed criteria and seek uniformity. Oranges grown on the south of River Huai taste sweet, while on the north sour. It means the same fruit may have completely different tastes in different environments. In today’s world if we copy other countries’ model I am afraid it would be a case of oranges grown on the north of River Huai. China is the largest developing country. It has a vast area, huge population, and multiple ethnic groups. Its economic foundation is weak and its development is unbalanced in rural and urban areas. To address these uniquely Chinese challenges, there must be Chinese solutions. Since its founding, the CPC has taken the realisation of socialism as its mission. In the more than three decades of reform and opening up, the CPC has neither been rigid and conservative nor radical and subversive. Instead, it has opened a socialist path with Chinese characteristics. · and build China into a modern socialist country that is rich, strong, democratic, culturally advanced, and harmonious. · and the socialist system with Chinese characteristics. In the future, China will stay firmly following these three principles. We have confidence in our path, in our theory and in our system. I believe you are interested in the 18th Party Congress. 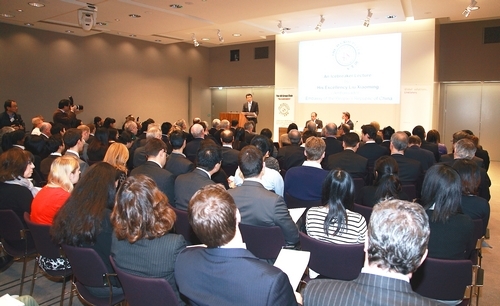 This is not only because you are interested in China’s future development, but also because you want to know what it means for China-UK relations. · China will develop friendly cooperation with all countries on the basis of the five principles of peaceful coexistence. · China will improve and further develop relations with developed countries, expand cooperation, manage differences and build a new type of relationship that is long, stable and healthy. This message of course applies to China-UK relations. All these strengths hold out great potential for our cooperation. China and Britain are two of the great leading nations in the world. So, China also stands ready to work with the UK in fulfilling the responsibilities of big leading countries through closer communication and coordination. We are ready to join efforts with Britain in addressing such challenges as food security, energy security and cyber security. Of course deepening cooperation would be impossible without political mutual trust between our two countries. Hand in hand with this is better shared understanding of our two peoples. As we have differing cultures and histories there are bound to be issues that pose challenges from time to time. But, if we strive to deepen a genuine and sincere understanding then this should be the way to achieve true harmony in our relations. The year 2013 will be a major milestone for China with a new leadership taking up their responsibilities. As these leaders take office we hope China and UK will neither waver nor invite troubles. We hope the leaders of China and UK, and all the peoples of our two countries, will work together for another fruitful decade based on mutual respect and equality. Thank you. I will be glad to take your questions.